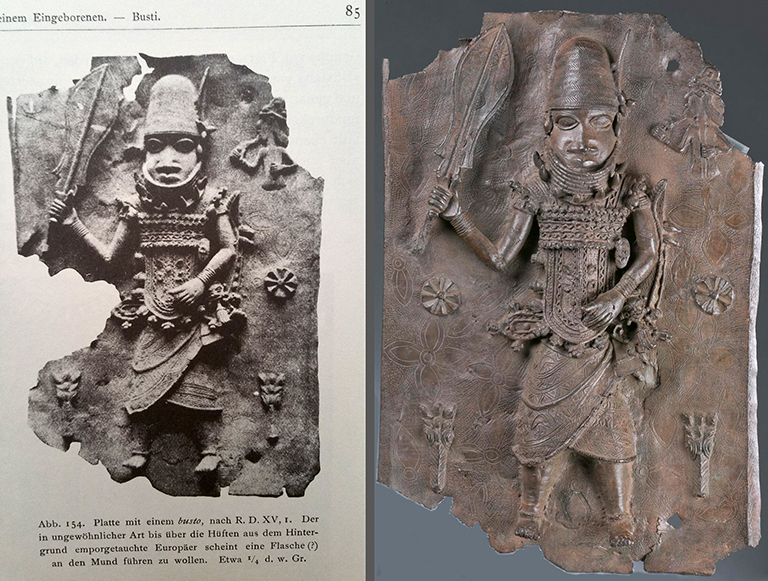 FALLS CHURCH, Va. – A 16th-century bronze plaque recovered in 1897 from the charred ruins of the Benin Kingdom’s Royal Palace (Benin City, Nigeria) leads the Oct. 1 auction of the late Merton D. Simpson’s private collection. Quinn’s Auction Galleries in Falls Church, Virginia (metro Washington, D.C.), will conduct the Oct. 1 sale, which includes artworks and rare African relics from the renowned tribal art expert’s personal collection, his Manhattan gallery, and some of his own paintings. The plaque was one of 304 examples brought to the UK by Ralph Moor in 1897 following the Benin Expedition. Once having adorned wooden gallery roof supports around a large reception courtyard in the palace, the remarkable artworks were displayed later that year at The British Museum. Following the exhibition, the Museum acquired (as a gift from the British government) 203 plaques from the collection. The remaining 101 plaques were sold to British and Continental museums; and private collectors. The plaque from the Simpson collection is numbered 192 on the 1898 Foreign Office list pertaining to the group acquisition. It remained a part of the institution’s collection until 1950, when the Museum de-accessioned some of its plaques. 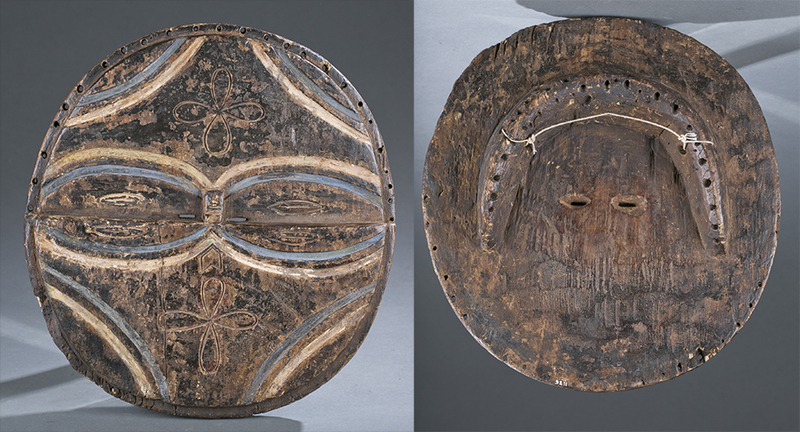 It is believed that Merton Simpson, who began collecting African artifacts in the 1950s, may have acquired his plaque through a European dealer, as the object appears to have been expertly restored to European standards at some point in time. The object measures 48.58 cm by 33.18 cm and is adorned with the single figure of an elaborately garbed warrior chief holding an eben – or ceremonial dance sword – indicating his participation in a palace ceremony. Other embellishments include a longhaired Portuguese man in profile, two crocodile heads and rosettes. The plaque has been authenticated by prominent ancient art expert John A. Buxton, ISA CAPP, whom Quinn’s enlisted to oversee and supervise the Simpson auction; and Kathy Curnow, PhD and Associate Professor, African Art History, Cleveland State University. It also has undergone a rigorous forensic examination by Mark Rasmussen of Rare Collections, a respected firm that provides scientific investigation and research services to leading museums and private collectors here and abroad. Quinn’s conducted an exhaustive search of all relevant art loss registries, including those of INTERPOL and other international sources, to confirm the plaque’s lawful status. It is similar to an example in the Smithsonian’s National Museum of African Art and previously was part of the institution’s Hirshhorn Museum and Sculpture Garden. It is entered in the auction with an $800,000-$1.2 million estimate. Other top highlights include a horned plank Bedu mask with checkerboard design, Ivory Coast/Ghana, first half of 20th century, est. $10,000-$15,000; and a 15th to 17th-century seated clay figure from a cache uncovered in the 1980s in Mali, Niger Delta, est. $10,000-$15,000. It is believed that all of the figures from the Mali discovery now reside in non-U.S. museums or private collections, making Merton Simpson’s example all the more desirable. Also estimated at $10,000-$15,000, a 20th-century Pwo mask from the Democratic Republic of the Congo, Chokwe culture, depicts a female with an elaborate fiber coiffure. 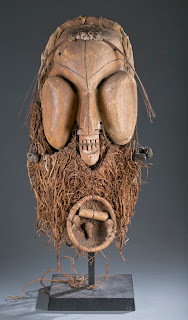 Another wood mask from the Congo exhibits the type of composition and decorative style favored by the Teke people, late 19th to early 20th century. Its character’s oval-shape eyes are outlined in blue pigment. That, combined with its abstractly interpreted features, suggests the mask was likely produced by the Tsai group of the Teke tribe. Estimate: $10,000-$15,000. A 20th-century night mask created by the Bacham culture of the Republic of Cameroon is similar to an example sold in Christie’s Amsterdam’s July 2, 2002 auction of tribal art from the Estate of Baron Freddy Rolin. Quinn’s has set an auction estimate of $5,000-$10,000. The Ejagham people are best known for their large, skin-covered, headdress-style crest masks that often have one or more faces of known or imagined individuals. The Simpson collection includes a skin-covered headdress with curled horns from the Ejagham of Nigeria. A 20th-century piece, it could realize $3,000-$5,000. With an acclaimed eye for spotting exceptional art and a career as an art dealer that spanned more than 50 years, Merton D. Simpson (African-American, 1928-2013) was one of the world’s most respected African and tribal art dealers. He was instrumental in helping individuals and institutions around the world to build comprehensive, historically significant collections. He was also a gifted artist in his own right and an early member of the Spiral group, a collective of African-American artists co-founded in 1963 by Romare Bearden, Hale Woodruff and other notables. The Saturday, Oct. 1 auction will take place at Quinn’s Auction Galleries at 360 S. Washington St., Falls Church, VA 22046, starting at 11 a.m. Eastern time (doors open at 9 a.m). Those who cannot attend in person may bid absentee, by phone or live online via LiveAuctioneers.com, Invaluable.com or Bidsquare.com. Items may be previewed at the gallery Sept. 23-24, and Sept. 26-29 inclusive, from 10-5:30; or from 9-11 a.m. on auction day. The gallery will be closed on Sunday, Sept. 25. For additional information on any item, call 703-532-5632. Visit Quinn’s online at www.quinnsauction.com.